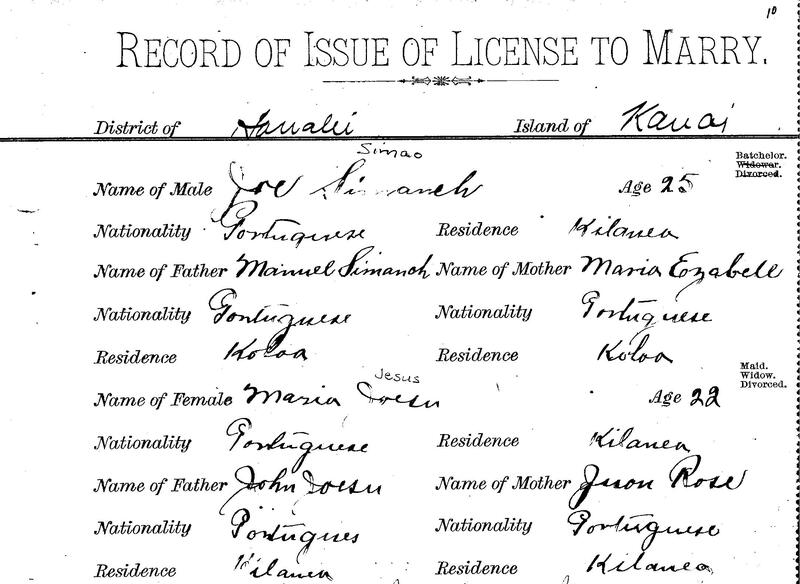 Recently, I’ve heard several Portuguese Hawaiian genealogist lament trying to find their ancestors in records because there are so many variations with the names. It’s true. No matter where your ancestor were originally from chances are you are going to find them in records under at least a handful of different names and spellings. It can be confusing. But, it is the reality. You have to accept it then make room for it when you research. I thought this marriage license from Kauai, Hawaii is a good example of how messed up names could be. Someone (not me) wrote the real surnames above the names making it easier to identify the couple. The groom was Jose Simao, but he is noted as Jose Simanch. The bride is Maria Jesus, but she is noted as Maria Joesu. How can someone get it so wrong? Let’s think about this a bit. Let’s say whoever reported the information was illiterate or let’s say the person recording the information wasn’t familiar with Portuguese names. The names are going to be recorded as they were heard, phonetically. Simao sounds a lot like Simon (the ao making a on sound in Portuguese). Given accents Simao got recorded as Simanch. Maybe the person reporting this had a speech impediment. It’s easier to understand how Jesus became Joesu. I have a distant cousin whose grandfather used the surname Jesus. Later he switched to Santos for no reason that anyone can put together. She pronounced it “Jeh-zoo”, similar to Jesuina (Jeh-zoo-ee-na). When you say that out loud you can see how it could become Joesu. Let’s look at some of the other names on this. Joe’s parents were Manuel Simanich and Maria Ezabell. Ezabell clearly a strange way to spell Isabel/Izabel. Maria’s parents are given as John Joesu and Juon Rose. Her mother’s real name was Joana Rosa. You can see how Joana can become Juon. Next time you are having trouble finding your ancestors in the records, try sounding the names out phonetically. Say them out loud. If you don’t know how they would have sounded in your ancestor’s language, find a resource online that will give you the audio or use a language learning book or dictionary to get the sounds. Once you hear it, you can come up with different ways to write it. In some ways, I like finding these different spellings. Okay, I don’t like it that much. But, if the person giving the information was my relative, I’ve gotten a tiny window into the way they spoke. I can visualize them saying the words to the person recording the information. Try not to fret when names don’t match up perfectly. Remember to keep variations in mind. And, if you can’t find them say their names out loud the way they would have said them. You might come across a spelling you hadn’t considered. My Soares ancestors are listed in the Oakland census as “Swartz”. I hear that Soares in Portuguese sounds like “Shwarsh” so can sort of see how that could happen. Joyce, that is a good example of something being spelled like it sounds. Makes you imagine the accents and the enunciation of your ancestors, doesn’t it? My Ancestors are listed as ‘Rodrigues” but the way they said their name, they are listed as Rodricks, on one census they are listed as Rois was told its a abreviation. Then in other records Segroe never figure why. Edward, Thanks for your additions. Rodricks makes sense with enunciation. Segroe, not so much.